My campus is quite far away from everything, so not always easy to buy some stuff, such as food or whatever. My Queen with her car are not always available and same for my very good friend who lives about 45mn from my campus even though she often helps me on Sunday to buy food in Carrefour. So Queen and I decided to buy another car, and my life should be much easier now. Colt Plus from Mitsubishi, negotiated with all options. Deflectors have been just received and will be installed this afternoon or whatever. The volume is quite impressive. It’s supposed to be an environmental friendly car, consuming very few. I will drive to go back to my campus this afternoon or maximum tomorrow morning. Sometimes political news are surprising and even funny if not ironic. The political party in power, the Chinese Nationalist Party (KMT) controlling 75% of the legislature has a well-known history of dictatorship. Even though the president chief of the region (? – according who is talking to whom) has been democratically elected, it seems that many democratic values have been ignored or reduced to zero. To be convinced, we just need to read the news since he was elected two years ago. And now, guess what: the KMT is giving lesson about democracy. Whoah! That’s a serious accusation! On what is this accusation based on? Huang was referring to an invitation extended by seven Democratic Progressive Party (DPP) mayors and county commissioners to the Tibetan spiritual leader after Typhoon Morakot devastated the southern part of the country in August last year, and the city government’s decision to air The 10 Conditions of Love, a 53-minute documentary on Kadeer and her fight to improve human rights in Xinjiang in September. Obviously, the KMT only consider as important the Chinese tourists or business. The fact that the area has attracted investments from Japanese businesses is not important. The definition of democracy is different according the political party we are referring to. The opposition party (DPP) refused to play the KMT game about the ECFA review. The KMT considers the ECFA as a treaty while DPP says it is a simple agreement. Legally, it doesn’t seem that the ECFA is a treaty giving the fact that Taiwan is not introduced as a country and the “deal” was negotiated and signed between political structures, not governmental ones. So the DPP says that being a simple agreement the ECFA should be discussed article by article which has been refused by the KMT: “it’s a treaty so it must be accepted or rejected as a whole. 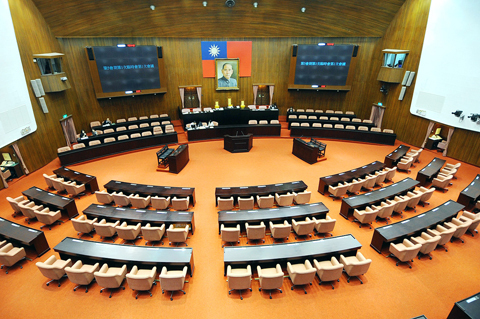 As the KMT controls 75% of the legislature, what could be the result? So why the DPP should play this game, this “unnecessary exercise to rubber-stamp the deal, for which every taxpayer in Taiwan is paying” (HERE)? So of course, the DPP could be now accused by the KMT of acting “irrationally” and refusing to cooperate in the democratic process. It is urgent that the DPP improves its image in the international media if it doesn’t want to be again considered as a “troublemaker”. The reluctant player here, the one who is exploiting the organs of democracy devoid of its heart and spirit, is the KMT, not the DPP. Since a while, we have news about a very soon (June) signed-ECFA or a delayed signed-ECFA. Monday: will be signed on June. Tuesday: few chance to be signed on June. Wednesday: good chance to be signed on June. Of course, all come from government’s members (according recent News). How come could we have different outcomes everyday? So more or less, China will accept (for the "early harvest" list) 500 items from Taiwan and the latter one, 200 from China. Anyway, we don’t know about the details (again!) but according the Premier, the 500 items represent 15% of the Taiwanese export to China. What’s about the 200 to Taiwan? What if the 200 represent 50% of the Chinese export to Taiwan? So, not only every day, we have a sort of “TV drama” about the ECFA, but more the deal is about to be signed, less we know about it. Beside, why does the government need to communicate by this way? Obviously, it seems to be a PR campaign. If you missed your favorite drama, watch the news! Few weeks ago there were the funerals of a gang leader in Taipei, with I don’t know how many luxurious cars and everything was done in public. According the news, officials from the Taiwanese administration attended (the mayor of Taichung?) the funerals. Did at that time M. Ma said it was inappropriate? So, is his speech a joke or what? And beside, There is one more related news (HERE), concerning the Tainan Prison Chief Guard Hsieh Shih-lun, who has been removed from his position. Hsieh was at the residence of Taichung gangster Lin Yi-hung (林亦宏) at the time he was murdered on Oct. 17. After receiving a DVD of the crime from an unidentified source, Democratic Progressive Party Legislator Chiu Yi-ying (邱議瑩) made it public at a press conference on Tuesday. So what do you think about M. Ma announcement especially after everyone knows (see the news) that politics in Taiwan is linked with the mafia and even some mafia members are elected (HERE and HERE)? A beautiful joke isn’t it? Maybe it was not a joke at all but it was like the story parents used to tell to their kids before they go to sleep. It’s Not a Donkey. It’s a Horse! Sometimes, I just like to read the news, avoiding to react immediately. And more than once within a week, we can see connections between some of them. Anyway as usual, most of the news concern ECFA, the link between Taiwanese administration and China, the connections between the underground world and politics and finally of course, justice. One of the big news (but not “new”) is the connection between politicians, the police and gangsters and the late example is Taichung. You may ask yourself what those officers were doing at the crime scene: investigating? Arresting? Protecting? As any police officer is supposed to do? And the chief of the police in Taichung tried to cover up the presence of the four officers. Finally, he resigned yesterday. It is a well known fact that gangsters are linked to local politics and KMT (the party in power) since a long time (see the article from AP in Yahoo News – in the above sources). And those links show no sign of disappearing anytime soon. But of course, elections are coming, so the Taiwanese administration must plays some PR games, by sending police commandos (41 officers) to Taichung. 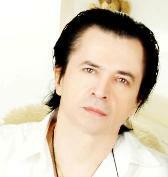 After a while, everything will be as usual forgotten and life will return as it was before. The only ones facing tough punishments and prosecutions are the members of the opposition party (DPP). So what did the Speaker offer as an excuse? But still, the Speaker asked from the prosecutors, a lighter punishment. Obviously when one is facing justice in Taiwan, it is better to be a member of the KMT than the opposition party. About the ECFA, the Chinese position is very clear and published in all international news: the ECFA is a step to unification. But the Taiwanese administration is saying that it is only about economic. See all the changes in Taiwan since 2 years: Taiwan is becoming closer and closer to China. All countries are condemning North Korea after a special investigation (conducted by international experts, not only by South Korean) found evidence accusing North Korea. But China, the only strong ally of North Korea refused to join. And guess what: Taiwan, in line with Beijing’s response, did not condemn North Korea either. Reports (HERE) said that a horde of retired military officers, led by former Admiral Huang Hsing-chiang, arrived in China to play golf with former officers of People’s Liberation Army. The funny (?) thing is that only Ma and his administration consider that nothing changed and the ECFA will be the road to the Taiwanese heaven. Ma and the KMT told to the people that the ECFA will allow Taiwan to sign FTA’s with other countries. 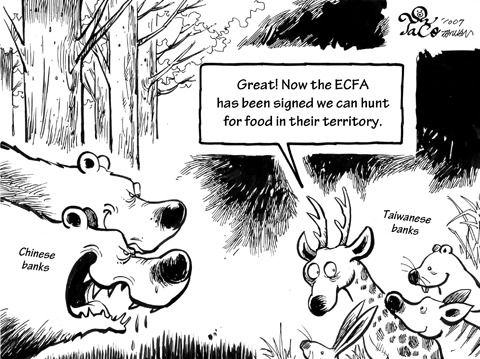 So Taiwanese should not be afraid of signing this ECFA. China has revealed its true colors. One more time. How did Ma and his administration react? They said that whatever the Chinese’s position, they will sign FTA’s with other countries. They totally refuse to admit the evidence. Many economists and experts worry about the consequences of the ECFA on the Taiwanese economy. But Ma and his administration is obviously in a hurry to ink the trade pact and therefore buries its head in the sand whenever this question is raised. Moreover, as it is already the case (I forgot where I read it), Taiwanese goods can only enter into Chinese clearance with a place of origin recorded as “Taiwan, China”. 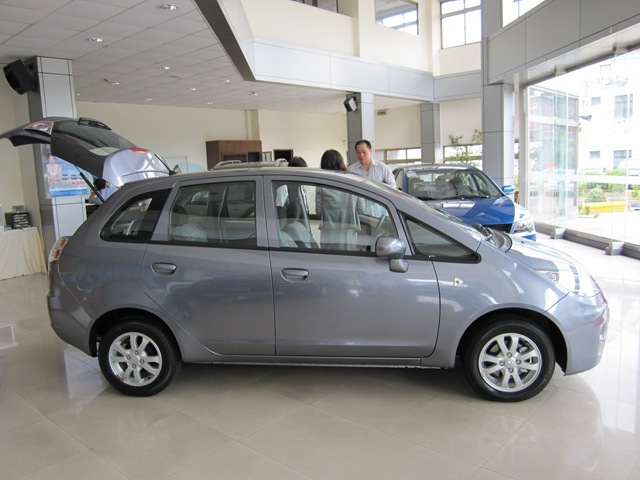 Taiwanese companies worked very hard and the “Made in Taiwan” is now recognized as a synonym of quality, while the “Made in China” brings images of bad quality, and dangerous products. What will happen after the ECFA is signed? Anymore “Made in Taiwan”? After two years of President Ma and his KMT administration, government debt has exploded by more than NT$700 billion. Obviously, the government’s claim that the reduction of gift and business income taxes and a trade pact with China would boost domestic investment and increase tax revenues is apparently a lie: if tax revenue was supposed to increase, why does the government need to increase the debt ceiling? Moreover, is the government hiding facts or manipulating statistics? Ministry of Finance statistics show the government’s public debt is forecast to reach NT$4.6 trillion at the end of this year, accounting for 35.2 percent of GNP — only 4.8 percentage points from its debt ceiling. However, Chien Hsi-chieh (簡錫土皆), another AFTR spokesman, accused the government of hiding the truth from the public by falsifying accounts of its debt, saying that the real situation was far worse. Will Taiwan become the Asian Greece before being unified to China? As asked in one of the above sources: is Taiwanese administration a fool or a fervent supporter of the Greater China ideology? In other words: it’s not a donkey. It’s a horse!